Pitt Football Coach Pat Narduzzi will be hosting his live, weekly radio show, alongside the voice of the Panthers, Bill Hillgrove, beginning Wednesday, August 29, 2018 at The Yard Market Square (100 Fifth Ave, Pittsburgh, PA 15222). The Pat Narduzzi Show, presented by Dollar Energy Fund, will air on SportsRadio 93.7 The FAN from 6:00 – 7:00 p.m.
Dollar Energy Fund is giving away a VIP package to attend a live broadcast of the show. To be entered to win, simply like Dollar Energy Fund on Facebook (www.facebook.com/dollarenergyfund) or follow us on Twitter (@DollarEnergyFnd). A winner will be chosen for each show throughout the season and the weekly prize includes a VIP table for four, a $50 food credit and Pitt Panther merchandise. Like or follow today for your chance to win every week! Make a difference this season! 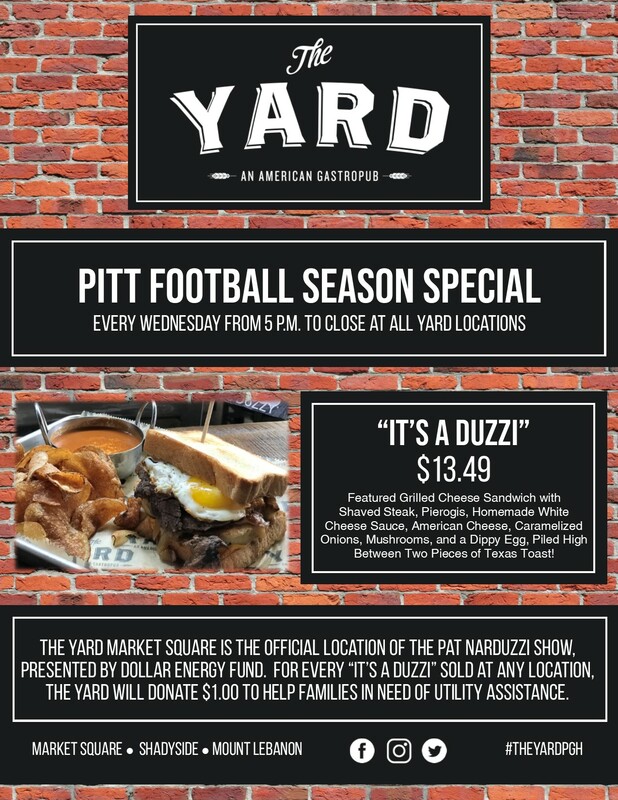 Ask about the Pitt Football Season Special every Wednesday from 5 p.m. to close at all Yard locations. For every featured sandwich sold, The Yard will donate $1.00 to help local families in need.